To God be the Glory! Everything that has a beginning must surely have an end! With gratitude to God for a life ‘well’ spent, we wish to announce to you the home-call of our dear brother, father, grandfather, and great grandfather, Pa #ASUU #STRIKE, who lived between Monday, July 1st 2013 and Tuesday, December 17th, 2013. He was aged five months and two weeks. You have contributed your quota to the Nigerian university education sector. Though you lived for a ‘short- period’, yet it was ‘so long a short time’. If you have an opportunity of coming back to this world and Nigeria in particular, please do not stop by in our schools again, because we are tired of seeing your face. You may wish to resurrect in Aso Rock, or at National Assembly, Abuja.Truly, we love you but the Federal Government loves you most. When you get to your destination, please eat with them what they eat there, drink with them what they drink there. 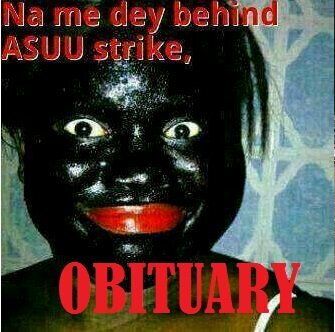 Rest in Peace, Oh ASUU strike! Funny but true, what a exit, rest in pieces and never you return ever again.